It’s the first day of Diwali today and every Indian household is preparing to kickstart the festivities in a gala way. This year it’s our first Diwali outside India, every year we fly down to home to celebrate it with friends and family. However this year around Mum-in-law decided to come and visit us. It’s really special having her around. She is working with me on spring cleaning the house, having the lights decorated in the small balcony, making sweets and savories, shopping for new clothes and jewellery. It’s like we have a Santa in the house way before Christmas. Today is a very auspicious day for Hindus, it’s called Dhan Teras. We offer our prayers to Goddess of wealth – Laxmi for success, prosperity and peace. It’s a traditional custom to buy jewellery or utensils for good luck. 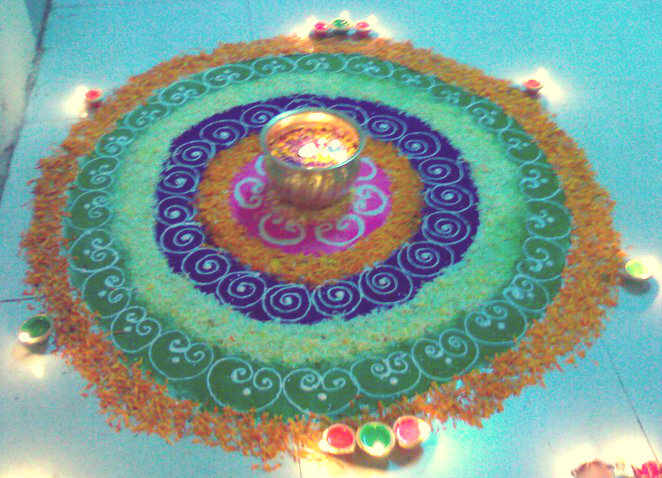 Rangoli is made at the entrance of the house welcoming the Goddess. Rangoli is hand made designs using colored powders and flowers. Deeyas (oil lamps) are used to enhance the decoration and also lighted as a traditional way to welcome the festival. Deepawali or Diwali is also known as a festival of lights. 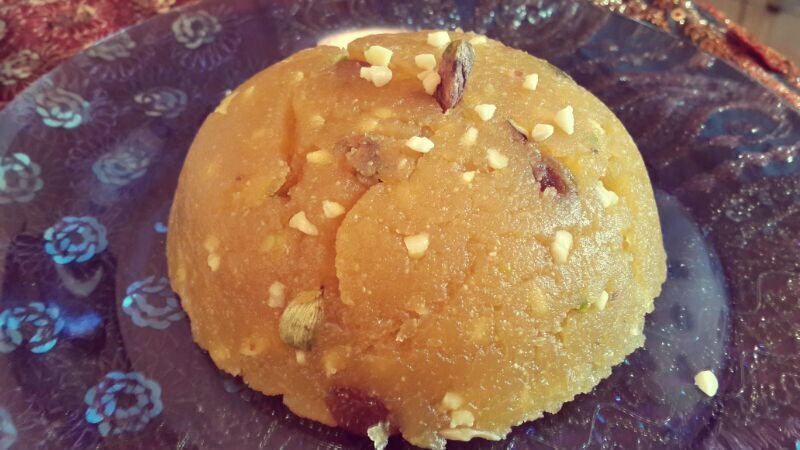 I’d be featuring some of the family favaorites in the coming days, starting with Besan Halwa. 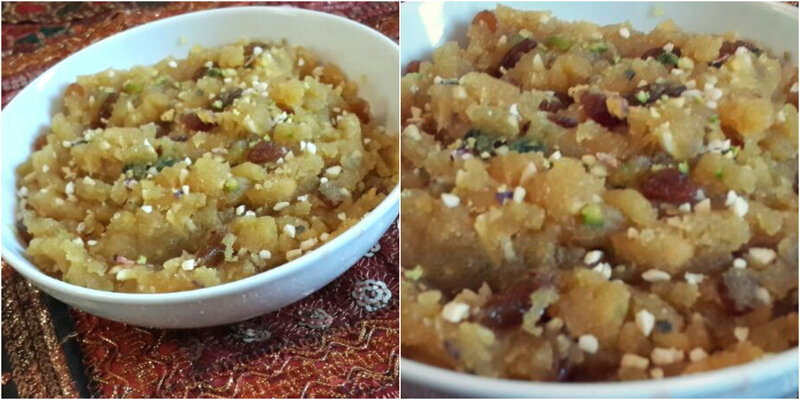 You can also read about Sooji (Semolina) Halwa and Rava Nariyal Laddoos (Semolina & Coconut Balls) I posted last year. In a saucepan, heat water on medium heat and add sugar and crushed cardamoms. 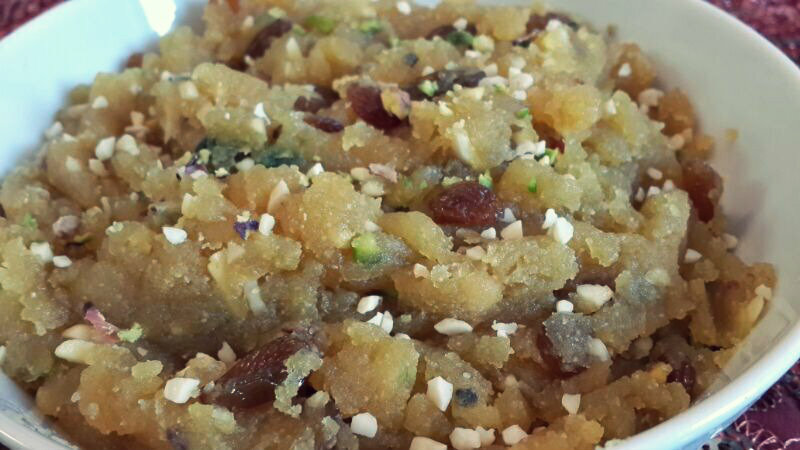 Adding the elaichi to the sugar syrup makes it fragrant and allows the sugar to blend in the cardamom flavors. In a thick bottom kadai (wok), heat ghee and add besan. Please ensure that you keep stirring the besan so that the mixture does not have any lumps. The color you are looking for is a pale golden and do not let the besan brown or stick to the bottom. While roasting the besan in the ghee, it gives out a very nice aroma. It is usually is good after 5-7 minutes. Add the coarsely chopped nuts, I used cashews, almonds and pistachios. In a different pan, heat some ghee and add the raisins and let them bloom a bit. Add the raisins to the mixture. Now add the sugar syrup to the mixture. Be careful with this step and ensure that the burner is on low heat since the syrup will start to bubble and will sprinkle all over. Blend in all of the mixture with the sugar syrup evenly and keep folding the mixture so that it does not stick to the bottom of the saucepan. After a few minutes, you will see the mixture thicken and almost start leaving the sides. Take it off the heat and transfer it in a bowl and garnish with some more chopped nuts.